I read your post about Elizabeth Gilbert’s book Big Magic a few weeks ago. I immediately bought the book, and I just finished the last chapter today; it was fantastic! 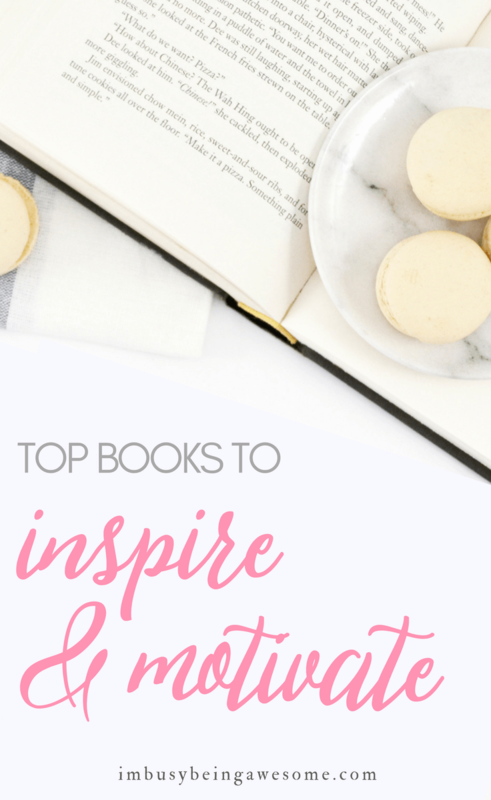 I’m wondering if you have any other suggestions for books that inspire and motivate? I am pretty open to style, topic, or genre. I’m not even particular about about fiction or non fiction. I’m just looking for some new book suggestions to boost my mood, offer new perspectives, and/or keep me inspired. I love getting questions like this. And since I know so many of you thrive on good reads as well, I thought I’d turn the question over you! So, my busy awesome readers, let’s help Karen out! Have you read anything exciting recently? What are your best books that inspire and motivate? Share your suggestions below! Also, if you have any questions that you’d like me to share on the next “Ask the Readers!” segment, please reach out! Quiet by Susan Cain – this book is mind blowing and explains so many things in regards to yourself, relationships, children…. Fantastic! Thanks for the recommendation, Jacqueline 🙂 I can’t wait to check it out! I have to be honest, I haven’t read any books in a while!! Ahh!! I’m excited to read the books shared in the comments though!! I would second ‘You are a Badass’. I also really enjoyed ‘I am Malala’, and ‘A Beautiful Work in Progress’ by Mirna Valerio. Oh, and if you’re into the human nature connection, ‘Braiding Sweetgrass’ by Robin Wall Kimmerer is wonderful. I think that’s all for now! I am getting some GREAT ideas from the comments though. Thanks for posting this! I loved You are a Badass, too. It was fantastic! I can’t wait to check out your other recommendations. Thanks so much for sharing them, Laura! I love reading! And I have a favorite author for sure, Brene Brown. Everything she writes is amazing. Also, I’m finishing 5 Second Rule. So, inspiring!! Yes! Brene Brown is one of my all times favorites, too 🙌🙌🙌 I love everything she does. I just got Braving the Wilderness, which I am so excited to start! I’ve heard many people recommend the 5 Second Rule. I need to check this out! I havend’t read an inspirational book in forever. I’ll have to peruse the comments to find a good one!! Thanks!! This is such a great idea for a post, but, honestly, I can freaking think of a book that inspires me. Like Not. A. Single. One. Will report in the future! I really enjoyed You Are A Badass, more health specific, but I also really enjoyed Body Love. I haven’t heard of body love, but it sounds great! I’m adding it to the list. Thank you! I just finished ‘House in the sky’ by Amanda Lindhout (she was kept imprisoned for 15 months in Somalia while traveling). Gave me goosebumps. And tears. Wow – that sounds like a really powerful story. Thanks so much for sharing! Love this! One of the best books I have read was “The Best Yes” by Lysa TerKeurst. While not technically motivational books, these four books really inspired me to start my blog and also help me to be more patient with the progress of my full time career. These people all just worked incredibly hard over and over again. Sometimes they had failures but they got up and kept going. Very inspiring to me! Thank you for posting this. I have been wanting to read more inspiring books but wasn’t sure what to read. The 5 Second Rule by Mel Robbins.